Is going to work and taking care of the house managable for you? When the kids are small, working outside the home doesn’t always make financial sense, especially if you have more than one child. When you figure up associated costs of working (eating out, the cost of commuting, work attire, and the big one: daycare), it’s often a little painful to realize how much you’re actually making per hour. But to do it, you’ll definitely need all the actionable time management tips you can get. Is working from home with little ones around actually possible? Many moms out there are making an income from home. You might be wondering how that’s really possible. Anyone who has taken care of a baby or toddler knows that blocks of extra time are few and far between. You don’t exactly know, but you know it took all day and you know it took every bit of energy you had and then some! By the time you get the little ones down for a nap, you’re worn out, and even then, you’re still on call, checking in on the breathing. Am I right? There are plenty of moms that find a way to make it work. I’m pretty sure they won’t tell you that it’s easy. But it’s definitely possible. The key to making it work? When you’re working from home with a family, it’s common to feel pulled in different directions. You have the household chores to take care of, the kids to take care of, and then you have your workload to handle. Making progress on all fronts requires you to manage your time effectively in each area. Finding ways to maximize the time you actually do have throughout the day, and cutting out the non-essential, is the key to making it work. There’s no doubt; it’s a challenge. But as someone who has a history of “shiny object syndrome,” I can tell you that the following tips can make a difference for anyone, and they can be practiced and built upon over time. Even the most scattered of brains (ahem!) can build new, productive habits that last. It may feel counter-productive; you only have so much time. Shouldn’t you be getting right to your to-do list? No. The planning will be worth it. As a work-at-home mom, you really need to use your time purposefully. Whether you have a block of time to work or only a few minutes, you need to know exactly what it is you’re going to do, and which tasks will make the biggest impact. Otherwise, it’s easy to end up scrolling through social media in avoidance, or overwhelmed and unproductive, staring at a blank screen, uncertain what you should do first. Or possibly exhausting yourself with busy work that won’t really help you achieve your goals. Quarterly planning, monthly planning, weekly planning, and daily planning are all important. Action step: Schedule consistent planning times into your monthly calendar and daily planner. Writing down your weekly schedule is more than worth the time it takes to do it. When you think you have more work time than you actually do, it’s easy to get really frustrated as you try to cram it all in. Filling out a weekly plan sheet makes it easy to see if you’re trying to fit more in than is actually possible, and also to see where the gaps are, to fit in blocks of time for specific tasks. For example, you can create blocks of time to handle emails once or twice a day, a block for deep cleaning once a week, and blocks for focused work time. Action Step: Track your activities for a period of time, then create a model work week. When I was ramping up my business, the needle started moving when I learned how to prioritize the right tasks. I used a simple mindset shift, prioritizing based on the “big win” for the day. There wasn’t very much time to work with so doing the very most important thing and celebrating its achievement was very important. I’ve since learned from my Mamapreneur Mastermind group that there is an actual productivity term for this: MITs (most important tasks). These are the tasks that will help you reach your big goals, but we tend to put them off in favor of easy and urgent tasks that don’t really matter much. Setting really clear goals will help you to set the most effective MITs. Action Step: Set specific, measurable goals with deadlines for achievement. Use these for determining your MITs (big wins!) when you do your daily planning. More often than not, the best ideas usually occur at the most inopportune times. When you’re in the middle of cooking dinner or washing dishes, mowing the lawn, at the park with the kids. Then when you sit down to work, you know you had an incredible idea, or an important task to add to the to-do list, but you can’t remember what on earth it was. Action Step: Get a notebook specifically for tracking all of your ideas and a whole bunch of post it notes. (Put them next to your bed, in the kitchen, in the car … wherever your best ideas come to you). 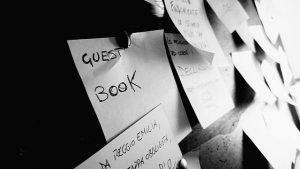 Jot down your thoughts, and then stick the post it notes into your notebook for later. Once you have your idea book in place, you can use it to fill in your master to-do list. This is an ongoing list where you write down anything and everything that needs to get done. Just the act of writing tasks down, and knowing you can refer to them when you prioritize, reduces the overwhelming feelings that decrease productivity. Action Step: Create a Google Doc or Word document, or get a notebook, specifically for your master to-do list. If you’re trying to cook dinner, clean up the toys, complete your work, answer the phone, and check your email, you’re just going to end up frustrated, with a whole bunch of unfinished tasks haunting you. Instead, make work time a time for focusing and finishing. Turn off all notifications: Don’t take any calls or check emails during work time (There are even apps that block social media to keep you on track). Action step: Take note of what’s working and not working during your next few work sessions; create a plan to improve your focus and implement. There are going to be days when you’re exhausted, or there simply isn’t focused time available. This tip will come in handy, especially on those days. When you do your daily planning, break your MITs down into smaller steps; make them as simple as possible. When you have five minutes to spare while you’re waiting for dinner to cook, or sitting in the waiting room, you can still make progress. Okay, so this is “rule-breaking” with multitasking and not the most efficient route; focused work is better, but you have to do what you have to do. And you can get a surprising amount done little bits at a time, if you know exactly what small step to take toward your MIT. Action Step: Break down your MITs into simple steps that can be done a bit at a time. If my husband ever reads this, he is going to laugh out loud at this one. Like rolling on the floor laughing. Because it’s the one I struggle with the most. I want to write the articles, do the grocery shopping, mow the lawn, take care of the bills … all in the same day. And the quickest way to get a pile of dishes done around my house is for my husband to start to do them; I will jump in and finish them regardless of what I’m doing. I think a lot of moms can relate to thinking they can and should do it all, but we only have so many hours in the day. Which of these could you apply in your life? Action Step: Make a commitment to let go of some control; decide on one specific area to start with. 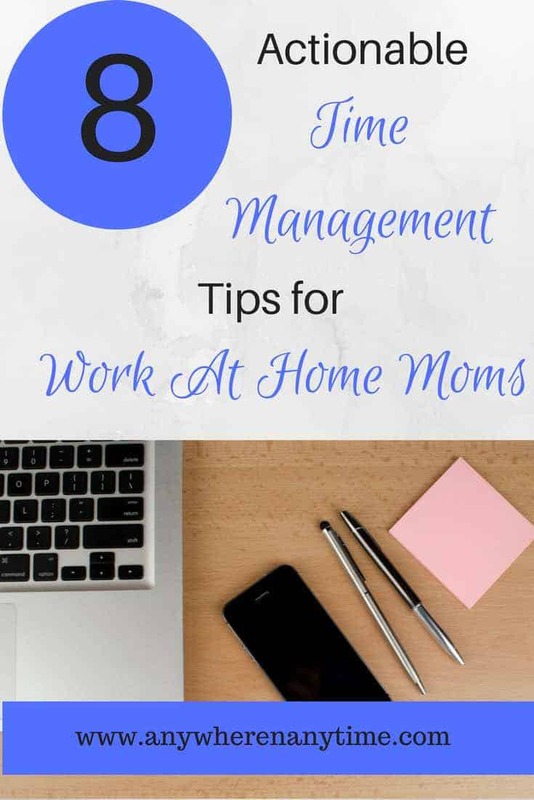 If you found these useful, you might also enjoy 3 Busy Moms Share Their Secrets to Getting Things Done or 18 More Actionable Time Management Tips for Work-at-home Moms. Which of the eight actionable time management tips for work-from-home moms have you mastered? Please share your secret in the comments below, especially if it involves how to let go of some control! I’d love to hear how you do it. While I logically know it’ll be a game-changer for productivity, I still haven’t mastered it. Any other great tips to share? Bring ’em on! 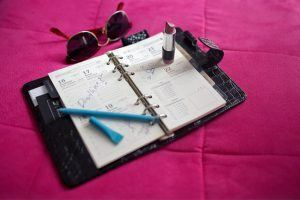 Great tips for not only the stay at home Mom but anybody who has a hectic schedule! That is true! Thanks Lisa! So many great tips in here! Wow! I especially like the part about “quit trying to do it all” as there are only so many hours in the day. It’s a hard lesson to learn, especially as a work from home Mom, but so important to do. Planning is also so important, plan it, sit down and laser focus during the time you have. Luckily for me, my husband doesn’t ask “what did you do all day”. He is out of town most of the time. My 2 girls are in school all day and we don’t have any friends or family that could help to take the girls for me to get some work done, as we just relocated to a different state. Turning off notifications would work for sure. They can definitely be a distraction. 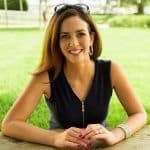 As a stay at home mom, I do feel like I should do everything since my husband is constantly out of town for work, however, I think I will take your advice and start assigning my 2 girls with some chores that will help me out. After all, I am the one who takes them to their practices and meetings, and so forth. I will talk to them and honestly I think they MIGHT be willing to pitch in. If not, then I guess this momma will just have to lay the law down, nicely of course. Thanks for reading the article. I’m glad you found it useful. The kids don’t seem to mind helping, as long as I keep it simple and offer some options. Hope you find the same. And it’s amazing how a little bit of help goes a long way! I really identify with not being able to let go of control and was laughing out loud while reading the end of this article. 🙂 I hope somebody has some ideas about how to accomplish this. I love your master to-do list idea. 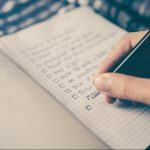 I have always broken down my tasks into mini tasks so that I could tick more tasks off my list – it makes me feel like I am actually getting things done. I loved this article and hope to be able to implement more of your ideas, particularly the planning ones.